Puppy socialization is one of the most important jobs we have as puppy raisers, but what exactly is socialization? 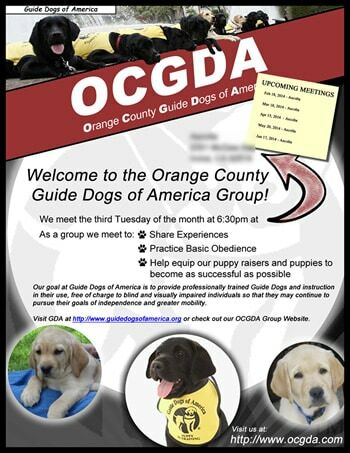 It’s been 3 years since I began organizing all of our Orange County Guide Dogs of America group outings to help socialize our puppies. 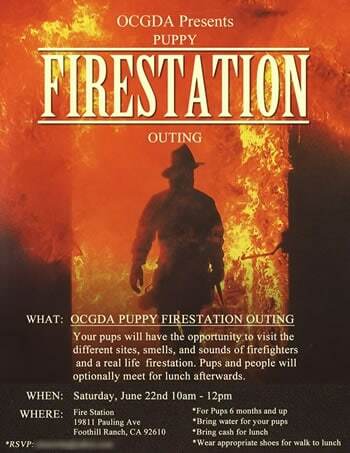 If you’re a GDA puppy raiser give me a “WOOT, WOOT!” Anyhow, along with taking over as OCGDA Outing Coordinator I was also told FANTASTIC fliers would help increase the participation in our monthly events. So, I was duped into designing fliers for our group as well as for the monthly outings. I wouldn’t say they are FANTASTIC and I’m not sure they increased the number of participants, but it does give me a chance to share some of the awesome outings we’ve organized over the years. If you’ve interviewed with one of our OCGDA group leaders then there’s a good chance you’ve already seen this flier. The three puppies pictured here are Baron, Yuki, and Dublin. At the beginning of every year I put together an events calendar outlining our outings for the year. I generally try to put together one outing a month. I’m not sure on all of these pups, but I think we have Stetson at the top, Dublin in the middle, Onyx on the bottom left. In the four square I think we have Duncan, Toby, Apache, and Ember. Outdoor festivals are great for puppies in training to get used to different sights, sounds, smells, and people. We’ve gone to county fairs, pet expos, local school festivals, as well as one of our favorites the Sawdust Festival. 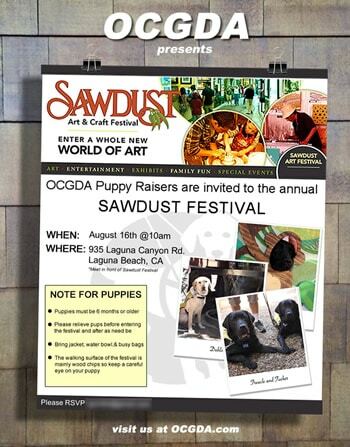 The Sawdust Festival is an outdoor art festival located in the beautiful city of Laguna Beach just a hop, skip, and jump away from the beach. WHAT ARE SOME THINGS OUR PUPS WILL ENCOUNTER? Park at one of the outside lots and you can ride the tram to the Sawdust Festival. We park about a 1/2 mile up the road giving our puppies a chance to ride the tram. There’s tons of wood chips all over the ground. It’s great for pup’s to learn to walk on different surfaces like this, but another challenge is keeping your puppy from picking these things up with his mouth. A good chance to work on “leave it”. They do glasswork on site which offers some different noises and smells. Artwork, shopping, food, stairs, and many other distractions for your puppy. Did I mention it’s close to the beach? We’ve walked our pups down to the beach for ocean breezes and summer fun. Did you see our video of Dublin at the Sawdust Festival? If not, click here. Another awesome adventure is taking your puppy in training on a boat or in our case a ferry! Our puppies need to be exposed to many different situations and what better outing then to ride the ferry to Balboa Island in Newport Beach. We start off with a long walk to tire out puppies out and head down to the ferry. Pups and people hop on the ferry for a ride to Balboa Island. We grab a bite to eat and head back home for a wonderful day of pups, sun, and fun! Walking along the dock can be a bit creepy for some pups. The wood bottoms along with a shifty ground can take a bit of getting used to for some puppies in training. Long walks on the beach…well not exactly on the beach, but near the beach. 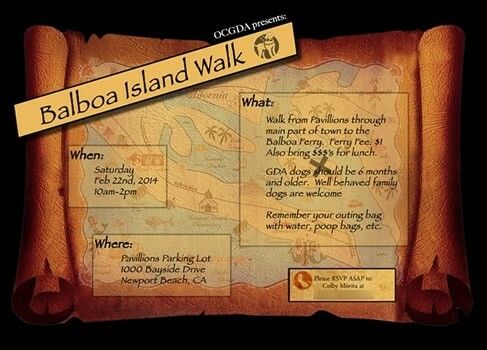 It’s a great day to exercise your puppy as we walk several miles to and from the Balboa Island Ferry. Pups walk in and out of the fire station seeing and smelling uniforms, fire trucks, and fire equipment. Fire truck drive by and siren. This can be pretty loud so make sure to put some distance between your puppy and the truck if they are noise sensitive. Fully outfitted fire fighter. Some pups are not too keen on people in masks especially ones that sound like Darth Vader! Did you see our video of Dublin at the Fire Station? If not click here. 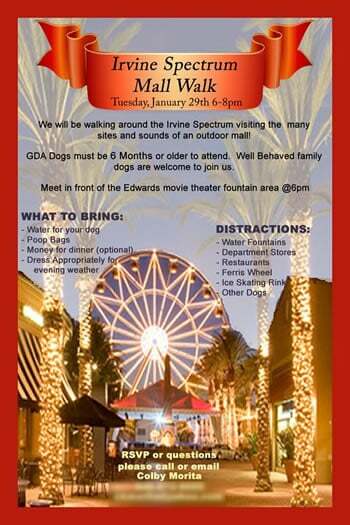 Outdoor malls are a great place to work with your puppy (indoor malls make for great outings as well). We always scout our destination beforehand and this can be very important as some outdoor malls are uber dog friendly, meaning lots of pet dogs out and about which can be very distracting for a puppy in training. Know your dog and know your outings. Other dogs. Sometimes lots of them. Be aware of not only your dog, but the other dogs you may encounter. Not all people and dogs are friendly. Mall stores and department stores. Pups in training get to walk in and out of the mall stores. Food Courts. A good time to work on tabling your puppy while grabbing lunch. Depending on which mall you visit you can encounter elevators, even better glass elevators. Funny water fountains. Some pups (just like kids) are quite amused of the many water fountains. We actually had a Scavenger Hunt at the outdoor mall at Fashion Island with Dublin. Did you see the video? If not click here. OCTA puts together an awesome training day the first Saturday of October (and now the first Saturday of April too!). Not only do they set us up with real life bus training, but they also hook us up with passes to Knott’s Berry Farm amusement park. 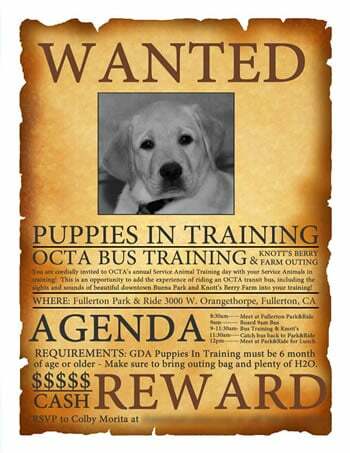 OCTA Bus Training day is definitely a must attend for puppy raisers in Southern California. Other puppy raisers and puppies in training. We’ve seen many other groups at OCTA Bus Training including GDA, GDB, GDD, CCI, CST, and many, many others. One year we even saw a puppy raiser working with a cadaver detection dog. The sights, sounds and smells of a bus. A lot of us don’t get on public transportation too often. OCTA bus training day is a great chance to ride the bus free of charge! Thanks OCTA! The sights, sounds, and smells of an amusement park. There’s lots to do at an amusement park like Knott’s Berry Farm. It can get pretty loud with roller coasters and kids running around screaming so keep an eye on your puppy to make sure he is taking the outing in stride. Your pups can also meet Linus, Lucy, Charlie Brown, Snoopy, and Woodstock. Outlaws and gunslingers are also common throughout the park. The bus drop off at Knott’s Berry Farm has a bunch of chicken out front. Make sure your pup doesn’t go chasing the chicks! Did you see our video of Dublin at the OCTA Bus Training? If not, click here. If that wasn’t enough for you then check out our Puppy In Training TV videos. A few years back we documented several of Dublin’s outings including Bass Pro Shop, Getty Museum, Movie Theater Outing, Disneyland, Metro Link, and many more. Puppy socialization is important for all puppies not just guide and service dog puppies in training. Even your family puppy should be well socialized with many different types of people, places, and things so they will grow to be a well-balanced dog. Some of these puppy socialization ideas are only suitable for guide and service dog puppies, but I’m sure you can think of others that would work just as well for your family pet. If you’re having problems thinking of different ways to socialize your puppy please leave us a comment below and we’ll help you come up with some suitable ideas for your puppy. What about you guys? What are your favorite outings with your puppy in training? Tell us about it in the comment section below. Great Tips. 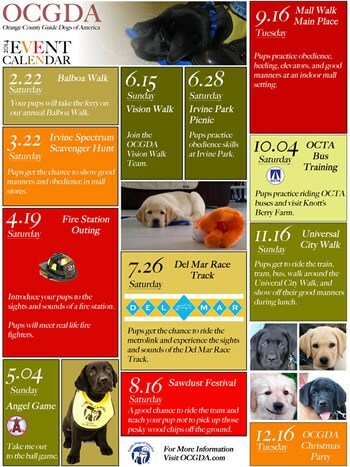 I love that all these places would be wonderful for all puppies, not just guide dogs, to get proper socialization. I love encouraging puppy owners to get their puppy out to places that are safe and healthy (not high traffic with other dogs). All these events/places fit the bill. Great to know! Thank you. I live in a suburb next to a rural community in central Pennsylvanian where most people still don’t realize the importance of puppy socialization. There are no dog parks. Most fairs do not allow dogs as yet. No busses. There is a train about one hour away. We adopted a 4 year old labrador that was never socialized and it is painful. So the 12 week old puppy we just adopted, we want to be sure he is well socialized. I am fimilar with Laguna beach, its beautiful. Mifflinburg, Pennsylvania is nothing like it. I am trying to be creative in ways to socialize him. Do you have a list of things that puppies should try. That would help me think creatively, to get him socialized in this area. I don’t want to have a dog that is afraid of everything, it’s as painful for me as it is for them. Congratulations on your new puppy! Unfortunately, I do not have a list of places for socializing a puppy. It has been on my to do list. I’ll be sure to bump it up and try and get a puppy socialization blog post together with a list of things a puppy can try. Stay tuned!